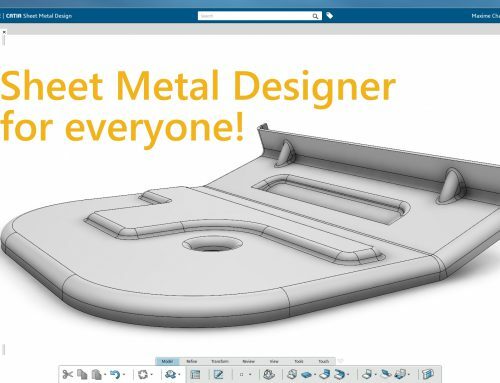 Since December 2016 the cloud users have access to the new 3DExperience 2017X release! 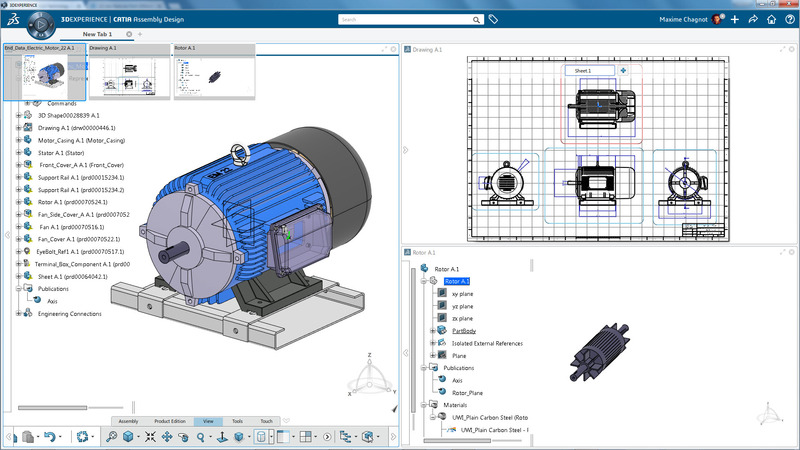 This article deals about 10 major updates that have been released for CATIA and ENOVIA 3DExperience on Cloud. 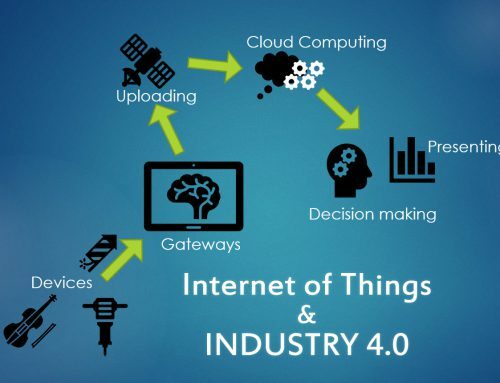 By reading this 10-points list you will see a modern user interface, the new visualization capabilities on the rich client and brand-new PLM functionalities in the Cloud Platform. By switching to this new 2017X release, the users will not be disrupted, the interface is similar to the previous release. However some few changes make a big difference: it is now much more easier to use features because of the new Essential tab in the action bar and the new Action Pad. 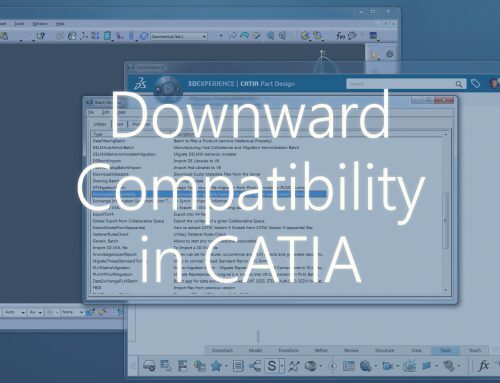 Each CATIA 3DExperience application contains an Action Bar, where the user can find “features” (or commands). This bar, located in the bottom of the screen, is split in several tabs: Specific features, Review, View, Tools, Touch, etc. From now on, an “Essential” tab has been added to all applications. It contains the most useful features needed for the application. Those features are classified by order of importance in the user process. For instance in Generative Shape Design, the Essential bar contains first the wireframe features, then the surface and the transformation features. This improvement helps a lot users to be more efficient in design process! The Action Pad is a flying panel where you can add features from different apps. It was released in the 2016X, nevertheless it was empty and you needed to customize it yourself, that could take some time. Now, for some applications, the Action Pad has been already filled by useful features, such as filters and wireframe creation. Here are two examples for Part and Surface design. 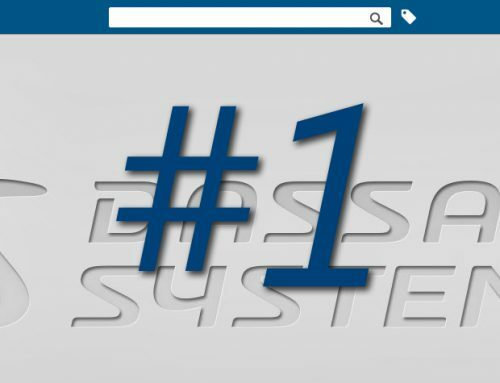 As in CATIA V5, you can easily customize your own tabs in the action bar and fill the action pad as you desire. In the previous releases each product, part, drawing, etc. was associated to a unique “view tab”. It means that to work on a product and a drawing at the same time, you needed to switch between the different tabs, such as Excel for instance, where you switch between different sheets. In 2017X, a “view tab” contains a window. You can open a product in a “tab 1” and a drawing in a “tab 2”. Reduce the window in the drawing’s tab and drag it in the product’s tab. 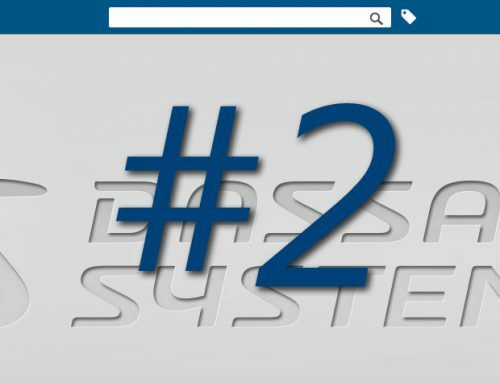 You will obtain two windows in the same “tab 1” and nothing in the “tab 2”. Because of the multi-windows mode, it is now possible to organize a tab into several blocks. Then the “tab 1” can be split in two, you will see a product in one side and a drawing in the other side. Moreover, you can drag a tab outside the main window to another monitor. This multi-windows mode is really pleasant for the users. Product Finder is an ENOVIA application that allows you to explore really big assembly. It generates 3D lightweight models for parts and products in order to move smoothly through and around an assembly. In the previous releases the lightweight models where manually updated, that is no longer the case, the are automatically generated when the server is indexed. 3D Completion command create a box selection (box, sphere, offset volume) that allows you to select parts among a product. The performance panel has been changed in this new release, it is now possible to configure precisely the display settings. The display settings are basically managed by your graphic cards. Verify that the graphic card settings are “Dassault Systèmes CATIA – Compatible” in the NVIDIA Control Panel or in the ATI Catalyst center. Or you can configure manually the full list of display settings, such as anti-aliasing, SSAO, outline, pixel culling, LOD, transparency, shadows, mirror, global illumination, bloom and capping. This allows you to customize your own display environment! However it can take more of your computer’s ressources. If you encounter any issue with the graphic drivers, check your graphic card’s compatibility in the Certified Hardware Configurations list. With the CATIA Live Rendering app, you can now import Substances (from Allegorithmic softwares) and create new covering materials in CATIA. Apply a material on a shape and you can visualize it with the “Shading with material” mode in the view tab. These materials can also be rendered. The result is just fantastic! The role Immersive Visual Experience (previously called Immersive High Definition) enables immersive capabilities for most 3DExperience apps using the enhanced local real-time visualization. 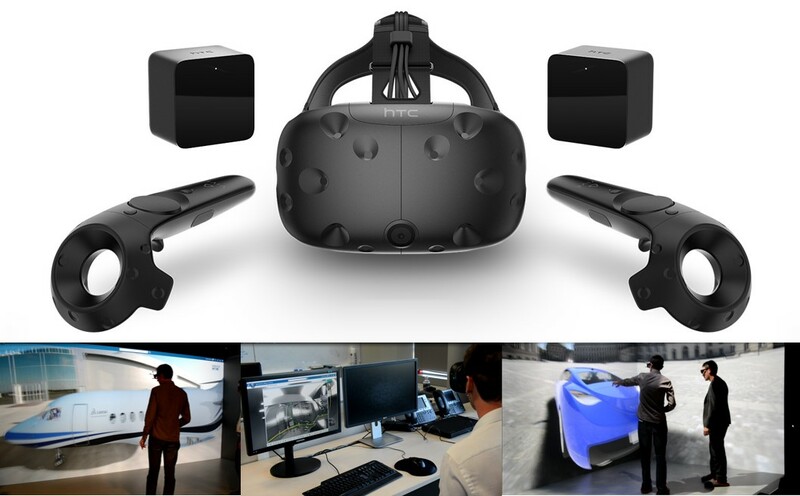 The brand new HTC Vive VR glasses are now supported by the 3DExperience Platform using a regular workspace (1PC, 1GPU).Visualize your product’s design in large scale for a better spatial impression. Experience a 3D navigation with a head tracking and evaluate the form, shapes and spaciousness of your design. It is also possible to display your 3D on Immersive wall and CAVE to tryout and check out your design in large scale. The Rich client platform includes now the offline mode. 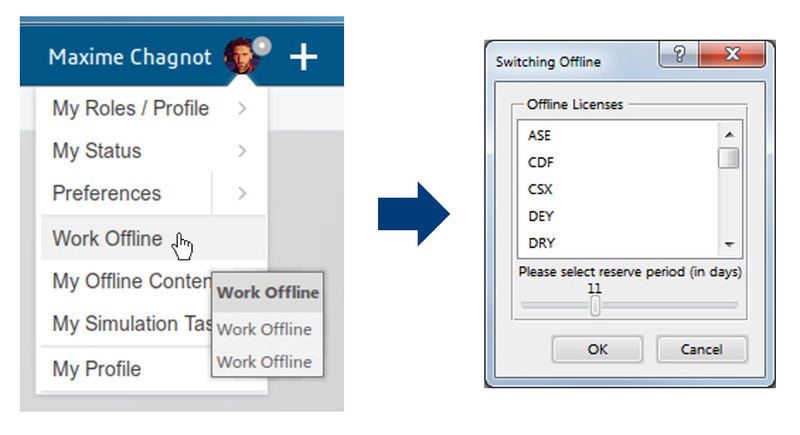 By clicking on the avatar icon on the right-top corner of the screen, you can now select the “Work offline” mode. It allows you to save your content locally and take your licenses with you for a maximum period of 30 days. 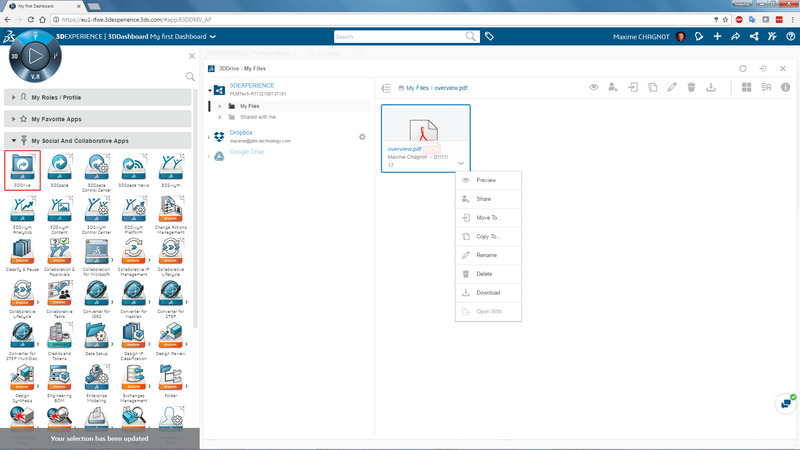 Switching between collaborative spaces when you are logged on the platform was not possible in the previous releases of the 3DExperience. Is it no longer the case with the 17X, you can now switch manually from a Collaborative space A to B. To know in which collaborative spaces you are, you just need to click on the home button on the top-right-corner of the screen. However, remember carefully to save your data on the correct collaborative space! 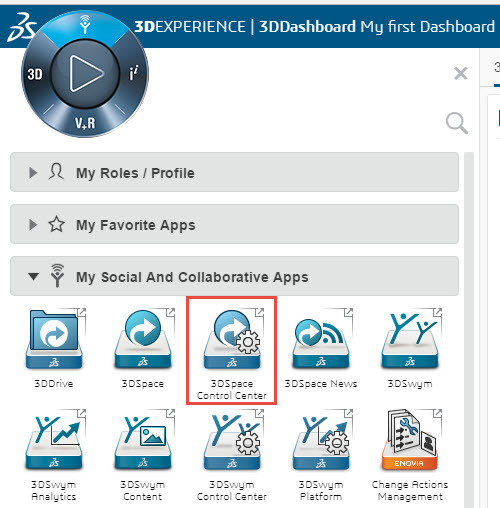 On the web interface, you can find the new application: 3DSpace Control Center (included in the platform). Manage the different collaborative spaces in the system, only if you are admin. You can change the owner of a collaborative space, for instance if one of the employee leaves the company, you can attribute his collaborative space to someone else. You can also give or block the access to the common space and you can easily enable or deny users to create Collaborative spaces. Custom your content, such as physical part/product’s attributes or naming. For instance, you can add the attributes “color” in the web interface and save it. Open the rich client, create a product, open its properties panel, you will see a new empty attribute line where you can enter your value (“red” in this case). It is also possible for you to add prefix, suffix, separators, numbers, etc. everything is easily accessible from your favorite web browser. A new app appeared on the web interface, this one is called “3D Drive”. This application (included in the platform) gives you a private space on the server where you can upload and download files and share them between the different users in the system. This also allows you to connect Dropbox and Google Drive to your server and manage content. For instance you can easily upload instructions, user’s guides, certificates, etc. in a PDF format that you can access directly on the rich client just by doing a search. Feel free to visit our 3DExperience page and do not hesitate to contact us for more information. We answer your questions!